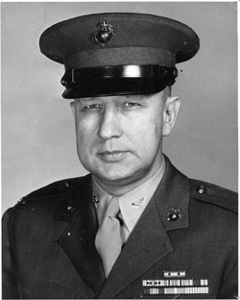 My father, Robert A. Scherr, Colonel, United States Marine Corps, entered the Marine Corps in 1942. Two weeks after his marriage to my mother, he deployed with the 1ST Marine Division and landed on Guadalcanal. He made all the landings through Okinawa. He also fought in Korea and Vietnam. A good portion of his career he served with the Judge Advocate Corps and was Chief Judge on the Court of Appeals when he retired in 1968. After retiring he went to work for the U.S Postal Service as Assistant General Counsel till his death in 1984. 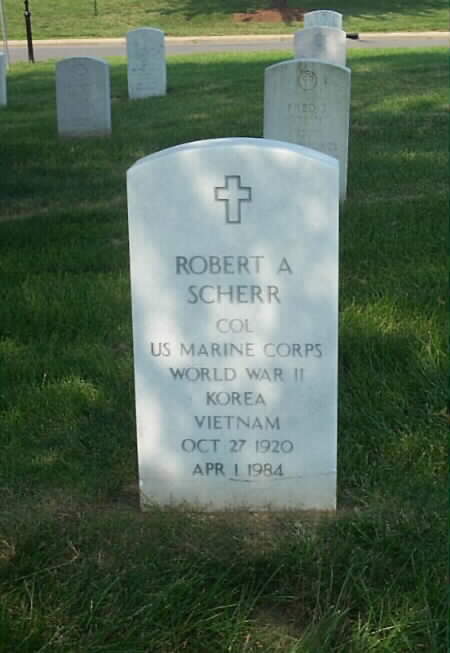 Here is some more information on my father, Robert A. Scherr, Col. USMC. Island Campaigns: Guadalcanal E. New Guinea New Britain (Cape Gloucester) Okinawa. In between several of the campaigns he spent time in Australia and New Zealand. After World War II he was stationed in the U.S. and was sent to Law School. During Korea he was in and out of Japan and Korea. I haven't been able to get the specifics as of yet. After Korea he was stationed at HQMC as the Legal Officer for the Marine Corps. In 1964 he was Stationed with the 1st Marine Air Wing in Japan. In late 1964 through 1965 he stationed in Da Nang, Vietnam. From 1965 to 1968 he was stationed at the Washington Navy Yard, serving as Chief Judge on one Court and as a member of two others. In 1968 he retired as a full Colonel after 26 years of service. He then went to work for the U.S. Postal Service as Assistant General Counsel for Transportation. 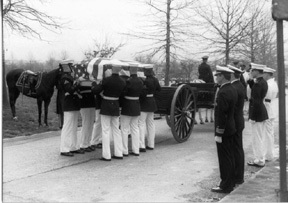 He died on April 1, 1984, the 39th anniversary of his landing on Okinawa. If possible, please put this at the end of his bio. I've spent my time in hell."